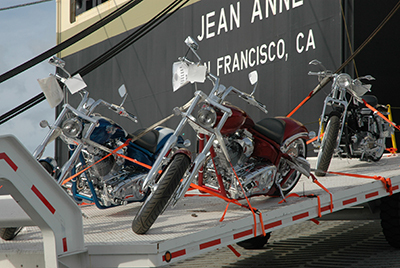 Pasha Hawaii offers a simple, affordable, fast, and safe method for shipping your motorcycle between the US Mainland and Hawaii. Our experienced staff will inspect your motorcycle and based on the style, weight and size will customize the movement and handling for a safe and damage-free sailing. We provide motorcycle shipping services to the following Hawaiian Islands. Skidding services are provided between Honolulu, Hilo and Kahului terminals and San Diego, CA. For service between Kauai, Molokai and Lanai and San Diego, skids may be available for purchase. Once loaded on board, your "pride and joy" will ride inside one of our fully enclosed auto decks, protected from the weather and harsh ocean elements. Motorcycles will have a minimum of four front and two rear lashings. Lashing inspections are double and triple checked before, during and after movement on the ship. If you lack a shipping skid for your bike, Pasha Hawaii offers a skidding service at our San Diego, Hilo and Kahului terminals. Your bike will be positioned on a sturdy steel skid and secured with four tie-downs. The bikes are then stowed on board and secured. After unloading at its destination, the motorcycle is removed from the skid and released to you or your representative.